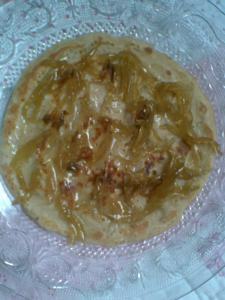 Atte ka cheela is a healthy traditional whole wheat pancake or crepe that is laced with the mild flavour of fennel seeds. Some people like it a little thicker like pancakes (unleavened) and some like it thin like a crepe. The thin cheelas are known as chithda (चिथड़ा ) in some areas, meaning a rag, because once folded it looks like a rag. I sometimes serve the atte ka cheela rolled up with mango chhunda. The meetha cheela is served as a breakfast or a quick snack, can be rolled up nicely with some relish or chutney and can be a good lunch box meal to be carried to work. Kids would sure love it in their lunch boxes. The recipe is simple and needs no specific instructions. Just take about a cup of whole wheat flour in a large bowl, for 4 cheelas mix sugar to taste ( I use 2 tbps for this quantity) and a tbsp of whole fennel seeds. Now pour enough milk in it to make a pouring consistency batter. Just that and now you are ready to make cheelas or pancakes. You need 2 tsp of ghee per cheela and chhunda or mango chutney or even jam or marmalade of choice as much you like. 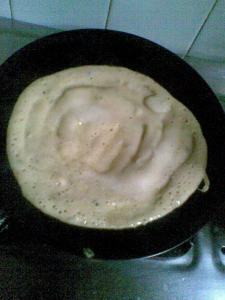 Heat a flat griddle or tawa and grease it with a tsp of ghee, pour a ladle full of the batter on the griddle and spread it like dosa or a thin pancake, let it cook for a while. 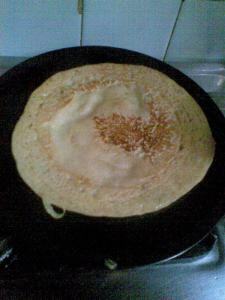 Pour a tsp of ghee on top and now flip it to be cooked on the other side too. When cooked it has to be soft and not very crisp. Take the cooked cheela off from the griddle, keep on a plate and spread the mango chhunda evenly on it (mango chhunda is made with grated raw mangoes and sugar and is something like candied slivers of mango). 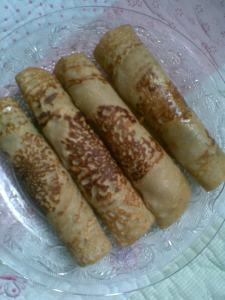 Now roll this up and serve hot or warm with lassi or hot or chilled milk. 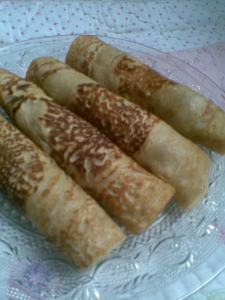 And tell me if you liked it for the simplicity and the taste which is so out of this world with fennel in the pancake combining very well with the sweet and sour chhunda inside the crepe like cheelas. Make your whole wheat cheela plain or roll it up with your favourite relish, this is the easiest breakfast or snack one can make with minimal fuss. Looks delicious! I usually make a banana filling. This looks tempting! First time here...this is a unusual cuisine in this blogging world..Glad to find you..nice n different collection u have..
@ kitchen flavors....dear why is your blog blocked n i can't reach there.. Your cheela looks delicious! I followed you from the foodieblogroll and I'd love to guide our readers to your site if you won't mind.Just add this foodista widget to this post and it's all set to go, Thanks! 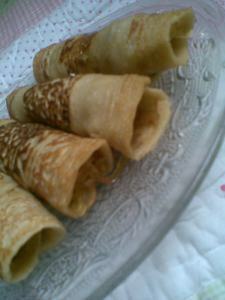 thanks foodista ...i have more pancakes here, check them out.